One of the most popular recipes on this blog is this Baked Ham with Pineapple Brown Sugar Glaze. Many have asked about using the same glaze on a boneless ham and so I decided to prepare one this recently passed Easter. Boneless ham is definitely easier and faster to prepare and serve. It is great for a smaller family or crowd. I bought a half portion boneless ham (about 3 pounds) sufficient for 5 servings. 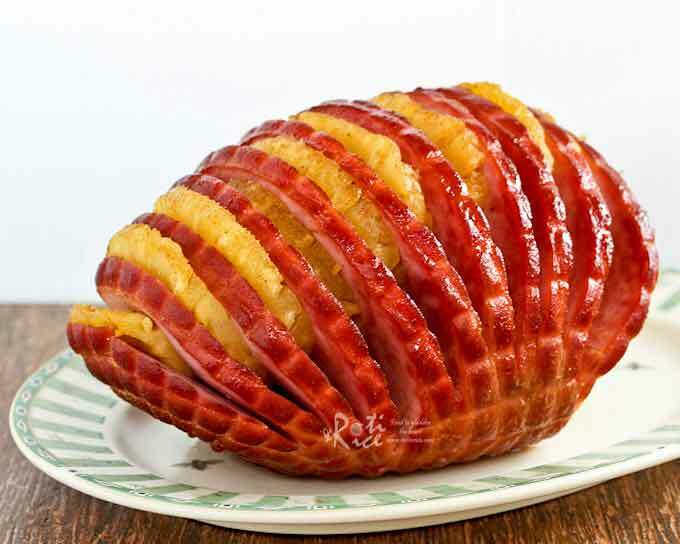 To make the presentation more interesting, I made this Hasselback Pineapple Ham by inserting the pineapple slices in between the cuts made in the ham. I was really pleased with how the ham turned out. It was really pretty and made a lovely main dish. YES, it was very tasty too! For this recipe, it is best to cut the ham yourself instead of getting a spiral cut boneless ham which often comes with very thin pre-cut slices. You want to make 10 incisions into the ham to accommodate the 10 slices of pineapple found in one can. Do not cut all the way to through so that the ham holds together and remains in one piece. If you want to feed more people, buy an entire boneless ham and two cans of pineapples instead of one. The other question that is often asked is whether ground spices may be used in place of whole spices for the glaze. In response to that, I used ground cinnamon and ground cloves in place of cinnamon stick and whole cloves. Combine pineapple juice from the can (about 1 cup/240ml) with brown sugar, ground cinnamon, and ground cloves in a small saucepan. Bring to a boil. 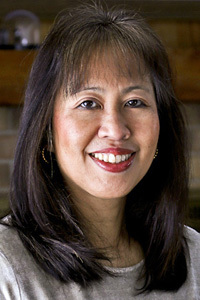 Reduce heat to medium low and simmer for about 10 minutes or until pineapple juice is reduced by half. It should be thick and syrupy. Remove ham from packaging. Rinse and pat dry with paper towels. Cut ham into ¼ inch thick slices until about an inch from the base. Do not cut through. 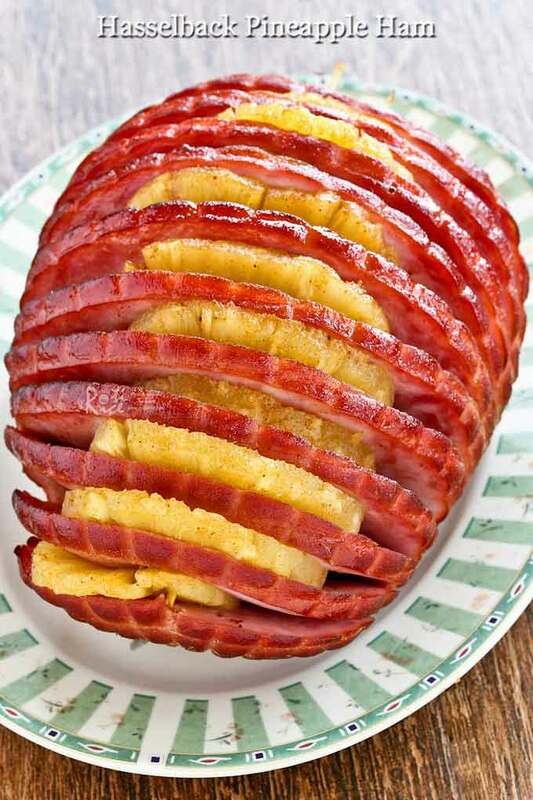 Place a slice of pineapple in each cut in the ham. Secure with bamboo skewer on each end right through the entire chunk of ham. Pour some water into the pan. Place ham in a preheated 350°F (180°C) oven and bake for 30 minutes. Carefully remove the ham from the oven and brush the remaining glaze onto the ham. Return to the oven and continue to bake for another 15 to 20 minutes. Allow ham to rest for 10 minutes. Remove the skewers before serving. 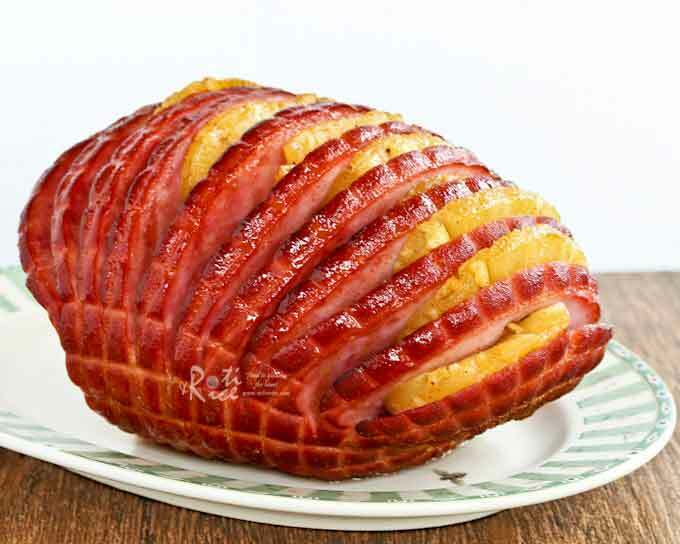 Boneless ham is available year round and this Hasselback Pineapple Ham takes only slightly more than an hour to prepare. Treat your family to it this weekend soon. Do give it a try. 3 days ago, someone asked about adding Maraschino cherries to the recipe. You can see the comment and my respond below. I thought it was a great idea as it would make it look very festive. I decided to try out my own suggestion about sticking the cherries into the ham with picks for our Christmas Eve dinner yesterday. It did make the ham look really festive and pretty. 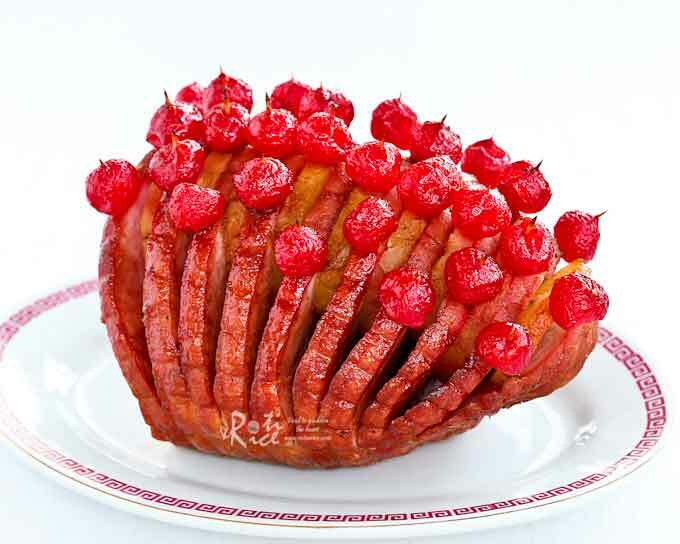 I LOVE all things hasselback! I never thought of doing this and am totally going to try it! It was great meeting you and Paul at IFBC. I hope to see you again. Me too. I love the Hasselback presentation. Makes the food look so elegant. It was great meeting up with you as well. Please keep in touch. If I use the bonelsss ham without much fats (ie store bought honey baked ham), by baking it for about an hour would cause the ham to be dry? I getting a 1.8 kg honey baked ham (about 3.5lb) not sure if it is fine to use this recipe, or to use the cockpot instead. The roasting time is only about 45 minutes total. Your 1.8kg ham should be fine. When using the larger boneless ham, do you still use the same cook time? I am looking forward to trying this! Thanks! Please read the packaging instructions. It will usually tell you how long to bake based on the size. This is for the first baking. The baking time after the second application of the glaze should be the same. I love this idea! How would I go about adding maraschino cherries? The same method as adding the pineapple? If so, should I mix the cherry juice with the pineapple juice? I would not add the cherry juice with the pineapple juice. 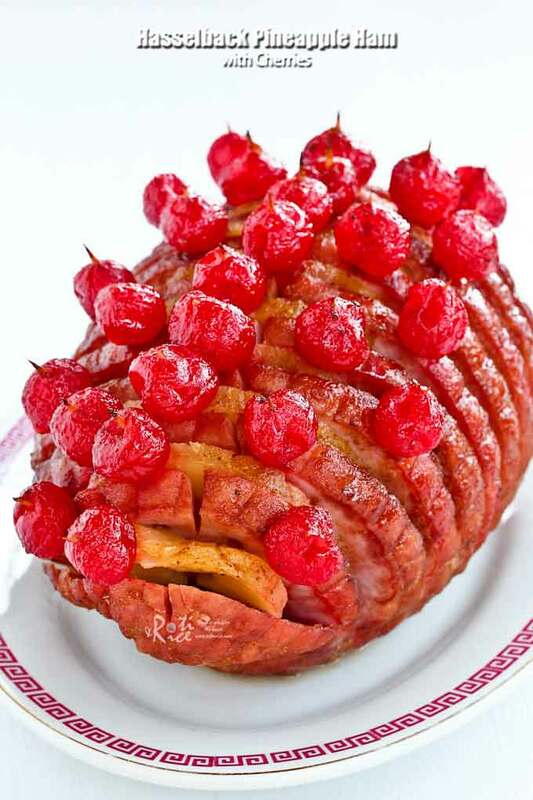 As for the cherries themselves, simply use picks to stick them into the ham decoratively. I use enough water to cover the base of the pan. The water helps to keep the ham moist and also facilitate easy clean up. Otherwise, the sweet glaze may burn on the pan.